The UK’s synchrotron science facility, Diamond Light Source, is a hub for renewable energy and energy recycling research, but less well known are its applications as a hub for nuclear research. Work in this area is transforming our energy future by making the nuclear fuel cycle safer, more efficient and more straightforward to use. Scientists using the facility have been invited to present their research into radioactive waste containment at the world’s largest and most prestigious science conference: the American Association for the Advancement of Science (AAAS) annual meeting, held this year in Washington D.C.
As part of a session entitled Cleaner Energy Solutions: What Can 21st Century Large-Scale Physics Deliver? a panel of three scientists will equip the audience with an understanding of pragmatic, achievable solutions to the global warming challenge in the form of nuclear fusion power, nuclear fission power and photovoltaics. Approximately 11% of the world’s electricity is produced through nuclear fission power, and it is an increasingly important factor in helping to reduce CO2 emissions in line with international targets. In recent decades, the use of nuclear energy has prevented gigatonnes of carbon dioxide being released. With proven capability as an alternative to fossil fuels, nuclear fission is likely to remain a central component of efforts to prevent future climate change. However nuclear power generates radioactive wastes: these can be extremely toxic and very difficult to dispose of. We already dispose of the low level part of this waste safely, but a small proportion is so radioactive as to be harmful to humans unless it is isolated from them. How to deal with this waste is a topic of much debate, and scientists are currently working to develop safe and effective solutions. Dr Claire Corkhill from the University of Sheffield is using Diamond’s unique Long-Duration Experiment (LDE) facility to study the way that cement – an important material used in the storage and disposal of radioactive waste – reacts with water as it becomes hydrated over a period of hundreds of years. This important work may help to inform the UK’s policy on disposal. Much of the UK’s nuclear research is supported by Diamond: a facility comparable to a giant microscope which scientists can use to study the atomic and molecular nature of matter. Diamond is used to support advances in medicine, technology and engineering: it is also heavily involved in helping to tackle the challenges associated with radioactive waste disposal. Key to the UK’s strategy for disposal is the plan for a Geological Disposal Facility (GDF). Under this plan, highly radioactive waste, immobilised in cement would be interred deep underground. But it’s important that we anticipate exactly what impact this approach could have on the surrounding environment. Some of this waste can take hundreds of thousands of years to decay to safe levels, and so scientists are trying to uncover the long-term result of interaction between radionuclides and their surroundings over these long timescales– that’s where the Diamond synchrotron becomes particularly important. “Timescales are crucial when it comes to nuclear research. Any facility expected to contain highly radioactive waste will need to remain functional for an extremely long period of time. Until recently, it’s been impossible to use synchrotron light to study interactions that take place over extended timescales. Claire is using this unique facility to study cement’s reaction with water over an extended period of time. If we plan to use cement in our GDF then we need to know how it will interact with its environment over many thousands of years. Examining changes over this period should make it easier to predict what might happen over a much longer time. 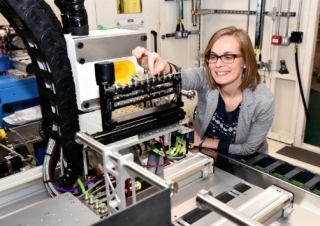 Claire’s research is transforming the way we view the challenge of nuclear waste disposal, and she will soon be presenting this pioneering work to other leading figures in the science community at the AAAS in February. The Manchester group are using one of Diamond’s spectroscopy beamlines, B18, to study how radionuclides, including transuranic materials, which arise from nuclear processes, combine and interact at the atomic level with natural minerals and microbes in the earth. In order to protect the surrounding environment, we have to understand the impact that radioactivity in the waste could have as the disposal facility gradually evolves over millennia and their work is highlighting that both minerals and microbial activity can actually act to provide a barrier to radionuclide migration in many systems. Meanwhile, Bristol recently used one of Diamond’s spectroscopy beamlines, I18, to study the residual contamination left over from the Fukushima nuclear accident that took place in Japan in 2011. An understanding of contamination of this sort on a molecular level can help us to better understand how to manage and contain radioactive waste. Bristol’s research has also helped towards identifying a means of reducing the costs and timescales involved in the disposal of intermediate level waste. Their efforts have supported the decision to make the process significantly cheaper and quicker to carry out – good news for the future of nuclear energy.